I earn a living working with horses, which makes me feel lucky. 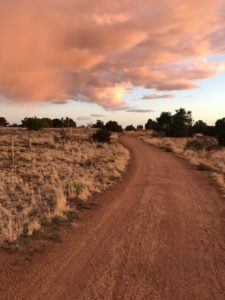 When I’m not riding, I’m running long distances, which makes me feel even luckier, but I admit there are times when my two passions are at odds with each other. Horse trainers work long hours and long weeks. I try to take one day a week off, but more than that is out of the question. 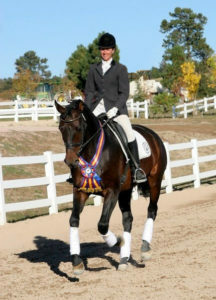 My clients are an understanding bunch who know me well enough to realize I need to to race some weekends, but I spend many of the other weekends at shows and clinics. This makes long runs difficult and back to back long runs almost impossible. My weekly mileage tops out in the seventies, no matter how hard I try. 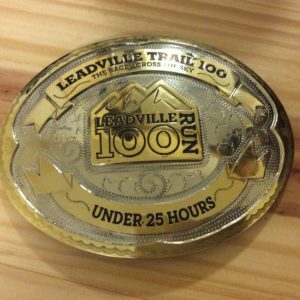 Compared to many ultra runners I know, I operate near the low end of 100-mile training. Lucky for me, the Santa Fe Rail Trail is five minutes from the barn. I don’t get to run the miles I do manage to fit in on fresh legs, either. My husband likes to point out that both of us have sitting occupations: he sits at his desk all day, I sit on horses all day. I love him dearly, but he is not a horseman and therefore does not know what he’s talking about. Working with horses is a very physical job. For one thing, I don’t just sit in saddles, l lift these heavy contraptions on and off horses all day. I also wield brushes and curry combs, walk lots of steps between the barn, the arena, and the turnout pens, sweep aisles, scoop manure, etc etc. Sitting a big trot takes strong core muscles. Even the time I actually spend on horseback is a workout. I don’t need to tell this to anyone who has ever ridden a horse, but people like my husband have the wrong impression. All of this means that when I go for a two-hour run after work, I’m already pretty tired. It can be hard to convince my body to switch into running mode. Most days, I get off my last horse, grab a protein bar to stave off hunger pangs, then change into running clothes at the barn and leave straight from there. I have learned the hard way that going home and sitting down leads to evenings spent slug-like on the sofa. After the San Diego 100. It’s a good thing I’m used to dirt! My disheveled post-run appearance is also not the problem it would be if I worked in an office. For someone who works n a barn, it’s perfectly fine to go for a run and then ride another horse or two without taking a shower in between. No one cares about me being sweaty and smelly. 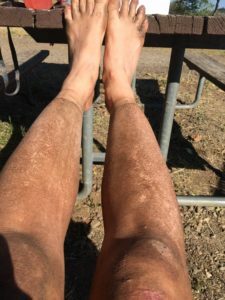 By the time I drive home, I’m covered in so many layers of dirt that flies follow me into my car, but it’s a small price to pay for not being stuck in a cubicle. Better than a cubicle, or a gym. Moving all day the way I do makes me tired, but it’s still more of an advantage than a handicap for my ultra runinng. 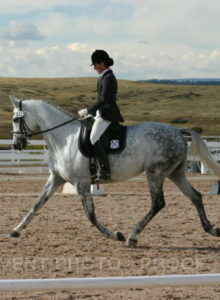 Riding a horse, if you do it right, engages the human core in a way few other activities can. 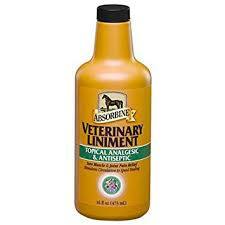 I often hear well-meaning friends express concern about the state of my back after riding so many horses for so many years. I tell them that my back is in great shape, as are my abs. My work is cross training for my hobby, which is really pretty cool. 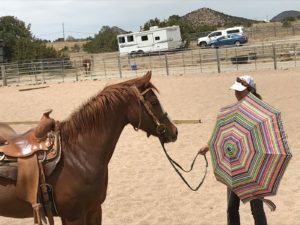 Teaching a young horse to expect the unexpected. I have learned it from them, they learn it from me. It’s also great mental preparation for long races to ride one horse after another, six days a week, in all sorts of weather. 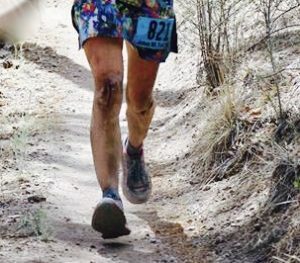 The twenty-plus years I’ve spent doing just that has helped me develop me the kind of resilience and grit that running 100s requires. 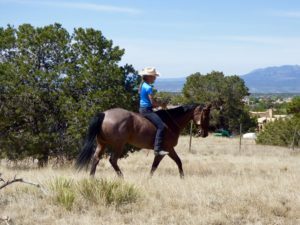 Horses are sensitive creatures who don’t always behave in predictable ways, so the kind of problem-solving on the fly that happens over the course of a 100 mile race is intimately familiar to anyone who spends time with them. Horses have taught me to get back up right away when I land in the dirt and to deal with things I can’t control without losing my cool. I’ve learned from them that calm persistence is a better strategy than getting frustrated when things don’t go the way I want them to. The list goes on. All the things I teach my horses pale in comparison to the skills they have taught me. Maybe all ultra runners should spend time at the barn; I highly recommend it. Buckles and ribbons are great, but they’re not what matters most. But most importantly, horses remind me every day how important it is to enjoy the daily training instead of focusing too much on the outcome. 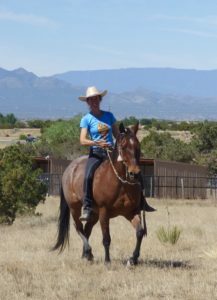 I want to be the best horsewoman I can be, just like I want to be the best ultra runner I can be, so it’s good to have goals, like blue ribbons or silver buckles. On the other hand, these goals mean little compared to what really matters, like trying to reach them with integrity and kindness to myself and others. Like feeling gratitude for the life I get to lead, the beautiful scenery I get to run and ride in every day, the many talented, beautiful horses and so many inspiring runners I get to connect with. I may have forgotten what it’s like to have clean fingernails or spend a weekend lounging around in my pajamas, but wouldn’t trade the horse-ultra life for anything. This entry was posted in Uncategorized on July 17, 2018 by silvakat. My hero! You not only talk the talk and walk the walk! you ride and run it! No one I know can compare to you, good, no, great job KATRIN SILVA. Hi Katrin, it was nice to chat with you going up towards Margaritaville this past Saturday. As I mentioned, I always enjoy your blogs and admire your disposition and perspective. Hope to run into you at a future race soon.